In fact, as somebody who almost seriously went to graduate school for linguistics and/or cognitive science, I can attest that though Pinker is an old hero of mine, when he started getting all positive about the world i wasn't all in at first.. Please don't take this post from me as aggressive, I just wanted to point out a few things about your post. You make a few mistakes early in your post. One is you're making the No True Scotsman argument. Essentially you're arguing that the bad Christians you assume we've met or are the cause for us leaving the church, aren't real Christians anyway. I think we need to trust people. If they say they're a Christian, I believe them. Also, things aren't that bad here on the Earth. We've got some issues, but the things you mention are actually better now than at any point in history. Allow me to point you toward a great, great book about this, Steven Pinker's Better Angels of Our Nature . It's a great book about this exact topic, I think it may allay some of your fears. Also, why is this life not enough? Why do you deserve more than this life? You're saying that unless you have the potential at eternity, this life isn't worth living. Why not? I've got an amazing wife, and I choose to spend some of my limited time with her. She's so great, that makes it worthwhile. I've got two great kids, my daughter is going to turn 5 in a few weeks and she's super fun to be around. I've got a 1.5 year-old son. He's crazy, no fear, always wants me to pick him up and throw him around through the air. I like to do woodworking and make really, really nice pieces for my family and friends that I just give away. I love looking at the beauty in the world. There's no intent behind it, but that doesn't make it any less beautiful and awesome. Why is that not enough? Why do you need more? You also forget that your third option also includes a place of eternal torment for people like me. You sincerely believe that I am going to burn in Hell forever. I try to be a good person, I put a TON of effort into thinking about ethics and philosophy. I like to help people, give away my time, and just generally do what I can. But as I'm sure you know, the Bible says that we aren't saved by works. So in spite of all my efforts, because I am unable to have faith, I have eternal torment to look forward to. It isn't Christians that made me an ex-Christian. They were largely just people where I grew up. It's the religion that I reject and everything about it. Just food for thought. May I recommend this book ? Anyways, a positive I got from the various lip sync videos is the ever present body cameras you see on the officers. I have been pondering a lot about the status of law enforcement in this country. I do not subscribe to the polarizing thin blue line vs racist trigger happy murderers debate, the ACAB vs blue lives matter crap. I treat them as these distance but close-siblings. When I see one I have respect for the dude/dudette. When they do good/stop violent bad guys I admire them. When they get hurt or killed on duty I mourn for them. But when they act reckless or bad, or try to cover up for each other I feel strong outrage that this happens in American law enforcement. Se está interessado em se aprofundar no assunto de por que violência aumenta ou diminui. Sugiro ler esse livro do Steven Pinker que é referência mundial no assunto. O livro foca mais no cenário global como um todo. Aonde a violência está diminuindo na média. Mas reconhece que em alguns focos na América latina violência está indo em direção contrária. O livro é extremamente extenso, a explicação não é simples, são diversos fatores diferentes. Mas uma das teclas que ele bate bastante e nos parece bem familiar no Brasil, é um Estado ineficiente na área de segurança. Apesar de alguns políticos populistas estarem apelando pra sugestão de que deveria ser responsabilidade de cada indivíduo se defender sozinho. O que o livro mostra é que historicamente a evidência é bem forte de que quem faz segurança é a polícia. Os estados brasileiros aonde a polícia está mal paga, com greves, paralisações, é justamente aonde estão os piores focos de violência. I'm not sure if this would work or not, but I would try redirecting people who have conservative or right-wing leaning views at least toward better thinkers than Joe Rogan and Jordan Peterson and toward optimistic views of the future of society, to cull some of the us-vs-them and zero-sum thinking that plagues these discussions. Sometimes it feels like men, especially, feel existentially threatened by other modes of thought, so being at least sympathetic to the good bits of their ideas and offering something similar but that promotes openness and liberal ideas may help. Hans Rosling's Factfulness presents a pretty optimistic view of the world. It's all getting better! Seriously! I had worried that the first book would be a reiteration of right-wing talking points around safe spaces, but I was surprised to find it a good listen so far. It mentions several cognitive distortions and how cognitive behavioral therapy can overcome them as well. The second book is sympathetic to conservative views and gives a good tour of moral psychology. Really recommend. 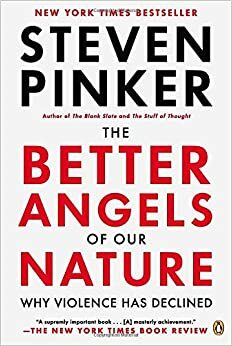 Steven Pinker's The Better Angels of Our Nature: Why Violence Has Declined is also good. Seriously, the world is getting better! Pinker is heavier on the nature side that most lefties, so knowing that may make people more receptive if they won't receive an gender argument without some mention of biology. They'll make you think (a lot) but they're good reads and super interesting.